You ARE the One | Choose Your Energy: Change Your Life! Have you ever known what you wanted to do, but felt that you needed the blessing of others before you could speak up or step forward and do it? Such a need for external validation is quite common. Stepping out on your own can be scary, which is why we don’t do it more often. Good news: your personal tribe is waiting for you to show up fully and lead. You don’t have to have the perfect answer, you just have to demonstrate the courage and conviction to say, “Let’s head in this direction,” and people will follow you! The word “courage” comes from the French word coeur, which means heart. Courage is not about an absence of fear. In fact, without fear, there is no courage. Courage is about feeling, respecting and transcending your fear to do what you know in your heart is right. When you demonstrate courage, you take heart and move forward from a place of compassion with right action. What is your heart calling you to do? Trust your gut and act upon it. Be the change you wish to see in the world. You ARE the one we’ve been waiting for. 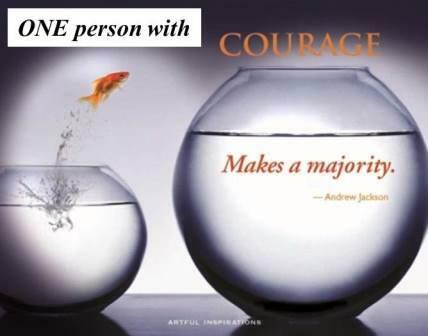 How will you demonstrate your own personal brand of courage today? What would you dare if you could transcend any fears of external judgement or failure? This entry was posted in All My Blog Posts, Authenticity & Purpose, Creativity & Self-Expression, Intuition & Intention and tagged Deborah Jane Wells, What is authenticity, What is creativity, What is intention, What is intuition, What is life purpose, What is my life purpose, What is the meaning of life, What is the purpose of life. Bookmark the permalink.